Change into your running clothes at the office and just grab your dog when you get home. Don’t sit down, don’t rest, just go. Have you tried running in the morning before work? You tend to have more energy in the mornings. 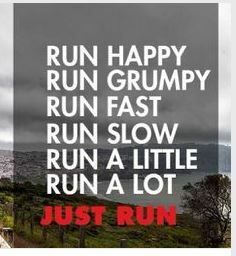 I’m same way but I just get my running clothes on and do it. Some days my legs are tired& I’m dragging but feel better & proud that I got out there & got it done. When I have to do runs in the afternoon, I will not sit down when I get home. Sometimes I just take a change of clothes with me to avoid going home at all. I’ve tried running in the morning and that just didn’t work with my schedule. I actually have two dogs but one just can’t run anymore – he’s 13 and actually pouts – I feel bad leaving him behind but he just can’t make it even a 1/4 mile before he’s done and panting. My younger dog is 7 and very fast but not as good on lead. I know he can make all the obstacles on the mutt run (but can I???) Good idea on changing before I go home and just leave – not allow my mind to stop me. I only drink one cup of coffee in the morning – I am thinking some afternoon Joe might help keep me going. I feel you on this. I go through cycles where I can run in the morning – but right now, my son is waking up early & at unpredictable early times – he wants MOMMY in the morning, so no run for me then. I drink coffee, lots of coffee all the time. I try to eat every few hours, but it’s tricky to find what to eat in the afternoon that’ll keep me going, but won’t give me GI issues at night. I can’t run until around 8:30 – I don’t eat dinner until afterward (we don’t have dinner as a family due to schedules & food issues, so not a sacrifice there). I have an office job as well…so when i get home..I don’t want to go ANYWHERE..i just want my pj’s and to just unwind…it makes it much harder to get back out there for my runs if i totally “unwind”…same thing goes for the gym….so I think the key to getting it done is to eliminate as many excuses as you can …. like the others suggested…I dress with my undergarments like sports bra or fitted cami and bring the shoes and pants to work so i can just pop those on quickly and head out either to the gym or straight for a run…I typically run evenings so I also don’t totally unwind …it’s all mental for me..if i let myself *sigh* or do that exhale like ahhh zzzzz that’s it for me lol….so just eliminate as many excuses as you can and try the java and see if that gives u the boost u feel u need. Keep remembering your goal. I once drank an energy thing – Pop Fizz in the afternoon – OMG DID I HAVE ENERGY! SO MUCH ENERGY! And then I read the ingredients & OMG the amount of caffeine & guarine & all that stuff that I’m now afraid to drink it for fear of having a heart attack or something. does your dog lead you or you lead, I have a English Springer Spaniel which loves to run but she drags me at the beginning after a mile we do sync but she just wants to go, any suggestions, oh and I like the jo in the afternoon, just one! I also find keeping the training treats pouch on my left side helpful – he will stay closer to me then.